Here are all the news from the year 2006 - some of these may be outdated already, so please check out the newest news for updates! Finally! It has taken quite a while, but finally now we have a proper Dio biography book! Martin Popoff, famous rock author and journalist, has released a book titled Dio: Light Beyond The Black, a biography focusing to Dio the band! Starting from the Holy Diver days and finishing with Master Of The Moon - there are a handful of lines about Ronnie's career outside of his own band Dio, too, but this book focuses to Dio. As a short review of the book - I'll try to cover more later on here - I can say that the book is certainly worth of reading even for the "I know it all" die-hard Dio fans. There are lots of interesting interviews from just about all the musicians involved in Dio and lots of small details revealed through those interviews. The book practically consists of interviews conducted over the years all the way. The author himself does not interfere much with the stories the band members tell in the book. I didn't count how many separate interviews there must've been, but the number is rather large. Just by looking in the credits section in the end of the book, there are loads of quoted interviews to the top of the interviews conducted by the author himself. With this many interviews quoted, there is certainly a risk of a rather sketchy book with no clear style followed throughout the book. For most of the book this is not the case. Popoff manages to keep the threads together and has chosen the interviews well - they support each other in many ways. However, sometimes it is quite interesting to read interviews from the same band members but with a couple of years in between the discussions. In many places the feelings shine through between the lines perhaps more clearly than if you'd read the interviews a few years apart as they were originally conducted. The book is available for order through Martin Popoff's own site at this address: http://www.martinpopoff.com/html/welcome.html Martin Popoff released about a year ago another Dio related book, "Rainbow: English Castle Magic." I haven't read it yet, but it tells the Rainbow story from the very beginning until the end of the Rainbow in the mid 1990s. The book is also available for order through Martin's site. Ronnie will appear on stage with Queensryche at the Gibson Amphitheater in Los Angeles, CA, USA on October 5th, 2006 to sing the part of "Dr. X" on the song "The Chase" from the latest Queensryche album, Operation Mindcrime II. The album, released last spring, also features Ronnie in the song "The Chase." According to the recent Rockline interview, Ronnie said he'll sing the Dr. X part at the last gig of the Queensryche tour in Anaheim, CA on December 2nd, but that gig is actually on October 5th already! After the touring is finally done for this year, Ronnie continues to work with the new Dio album, as well as will put finishing touches on the new tracks for the long-awaited "Black Sabbath: The Dio Years" box set. I'm not sure if this is just a working title for the album, or whether the released product will have this name. According to Ronnie, the first song is already finished and the second is still on its way. In the Rockline interview Ronnie mentioned plans for 2-3 new Elf songs with his cousin, Rock Feinstein! Those songs would appear on a remastered Elf CD release. Lets see if these plans materialize - it certainly would be interesting to hear what Elf would sound like in the 2000s! The European releases based on the 3*2CD Japanese box set continue. The first release, "Live In Cologne 1976" came out in July and now the second release, "Live In Dusseldorf 1976" will hit the stores in November. Apparently just one track from this gig has been heard before this CD release (not counting the new Japanese box set), as Catch The Rainbow was on the "Live In Germany 1976" 2CD set. All these 1976 live releases now are full shows on a double CD. Many of the songs have been heard before either on the abovementioned "Live In Germany 1976" or on the "On Stage" album. As reported earlier on, there is a DVD documentary in works focusing in the lenghty career of Deep Purple's vocalist Ian Gillan. The DVD will have numerous guests, including Tony Iommi, Jon Lord, Luciano Pavarotti, Joe Satriani and, of course, also Ronnie James Dio among many, many others. It will contain interviews, long lost archive footage and tales from Ian Gillan himself. The documentary is planned to be some 2.5 hours long, although there will probably be some variation to that figure. There are plans for three separate releases of this set - the Internet release will be a triple disc version, double disc release will be sold at the concerts and single disc edition will be available in regular record stores. The DVD set was originally scheduled for Spring 2006 release but it has been postponed. The current estimate is to have it out in late 2006. The company behind the set is CoolHead Productions. Dio's Master Of The Moon tour is soon over, just two more Japan shows left for October. However, I listed a while ago one more date here for October 3rd in Salzburg, Austria, where Dio was said to be opening for Deep Purple. This show is going to be Deep Purple only - apparently someone (the promotor? I don't know) made a mistake and started to advertise this show as Dio/Deep Purple. I was e-mailed by someone that there are even tour posters in Salzburg area advertising this show as Dio/Deep Purple. I had the opportunity to discuss about this show with Ronnie a couple of weeks ago in Denmark and it was the first time he even heard about the show. It'd be virtually impossible for Dio to do this show anyway, as Ronnie is going to sing with Queensryche just about the same time in California! One more tour related piece of news: Those two Japanese shows might not end the Master Of The Moon tour after all, there might be two more shows in horizon...more later, if those shows really get confirmed! Tracy's (ex Dio guitarist) and Larry's (ex Dio bassist) new band, "Epic", is going to play at Paladino's in Tarzana, CA on October 5th. The band has Brad Alden on vocals and Forrest Robinson on drums. DC4 (see earlier news for details) has been writing some material for a forthcoming release with Rowan Robertson. They're going to record their new album in mid November with producer Joey Vera. They're also looking for a record contract as well as bookings for Southern California gigs. Vinny will be a guest on the new XPELD album (already for sale, see their site here). Vinny is also going to be on the forthcoming Big Noize DVD, which will actually not be (at least first) released to the public, but to the record companies instead. The project is fronted by Joe Lynn Turner (Rainbow, Deep Purple etc) and has Vinny on drums, Carlos Cavazo (Quiet Riot) on vocals Phil Soussan (Ozzy Osbourne) on bass and Gary Corbett (Cinderella, Lou Gramm) on keyboards. Vic Firth - Vinny's choice for the drum sticks - has put up an interview with Vinny on their web site here. The soundtrack for the movie "Pick Of Destiny" will have one Dio track. The soundtrack will be released by Epic Records on November 14th at least in the US - it is likely that the European release is a day before. The movie will premier in the UK and US on November 17th, other countries will follow. For instance the Finnish release date for the movie is December 8th and Holland will follow in mid February, 2007. The movie will also feature Ronnie, who will play himself on it. ESP will release a DVD, titled as "Live At The Marquee", and it will feature Chuck Garric on bass. Chuck was the bassist for Dio on a couple of tours and participated also on the latest Master Of The Moon album. There will be a heavy metal cover album which features twelve Beatles songs. The artist list involved is rather extensive - Alice Cooper, Lemmy Kilmister, Steve Vai, Geoff Tate, Yngwie Malmsteen, Billy Idol and John Bush just to name a few of the people on the CD. There is also heavy participation from the Dio camp on the CD. "Lucy In The Sky With Diamonds" is covered by a line-up consisting of Geoff Tate (vocals) and Michael Wilton (guitars) from Queensryche, as well as the whole current Dio the band, minus Ronnie: Craig Goldie on guitars, Rudy Sarzo on bass, Simon Wright on drums and Scott Warren on keyboards). "Magical Mystery Tour" will have Jeff Pilson on bass. "Revolution" has Vivian Campbell on guitars and "Day Tripper" guitars are from Doug Aldrich. There is a new unauthorized book about Ritchie Blackmore out there now, titled "Black Knight." The author has interviewed and discussed with many people who have been somehow involved in Ritchie's life ever since his childhood - friends, relatives, band members and so forth. The book has 350 pages plus a picture and discography section. The book is available through a Deep Purple site at address http://www.deep-purple.net/. Benedictum, a new band from San Diego, CA, has recently put out a CD titled "Uncreation". The CD was produced by Jeff Pilson, who also plays bass on it (while the current bassist in the band is Jesse Wright). Jimmy Bain appears on "Mob Rules" - Black Sabbath cover - and Craig plays guitar on a track called Valkyrie Rising. The Mob Rules is available only on a special limited digipak edition of the CD. On August 16th at 8.30pm PST / 11.30pm EST / 4.30am GMT Ronnie will be the featured guest on the famous Rockline show with host Bob Coburn! This is a syndicated radio show, check out the stations which broadcast this at Rockline's own site! In addition to the traditional radio channels, the show will be streamed on the WAXQ FM from New York City on the Internet at this address. WHOA! Master Of The Moon tour, which started in July 2004, is now finally reaching its end (at least if no new dates will be added to it any more...;). The band just completed their tour in South and Central America and returned home for a couple of weeks. The last few shows will be in Europe and Japan. This is certainly one of the longest Dio tours ever, if not the longest one! Loads of shows throughout Europe with excellent reviews! Check out the tour dates on the Master Of The Moon tour date page! Dio's record company for a couple of albums, Spitfire, has been sold to Redux Records, formerly known as Sheridan Square Entertainment. Remains to be seen if Redux Records will reissue the Dio back catalog from Spitfire under their own name. After Dio the last gigs of this lenghty world tour, Dio will return to the writing mode. The band will start to work on the new album right away. The release date has not been set yet, but it seems likely to be something like the first half of 2007, about three years since the latest studio album, Master Of The Moon. There are already some speculations of the title of the new album but nothing confirmed yet. Former Dio guitarist Tracy G as well as former Dio bassist Larry "Bones" Dennison recently formed a band called Epic and they've got a new CD out now too! In addition to Tracy and Larry, the band features Brad Alden on vocals and Forrest Robinson on drums. Epic's home page can be found at this location and they're also present at Myspace.com - see their page there by clicking this link. Dio's former guitarists are busy with new bands. Rowan Robertson has joined band called DC4 which also includes Jeff Duncan on vocals and guitar, Shawn Duncan on drums and Matt Duncan on bass (I wonder if Rowan considers name change?). DC4 will tour in Southern California in a few weeks now with Rowan on board. DC4's Myspace.com page can be found at address http://www.myspace.com/dc4duncan. Ex Dio bassist Jimmy Bain and ex Dio drummer Vinny Appice have a relatively new band together, titled 3 Legged Dogg. They've also got Carlos Cavazo on guitars, Chas West singing and Brian Young on guitars. Rainbow's Live In Munich on DVD - now also outside Japan! VAP, Inc. released the October 20th, 1977 gig on DVD in Japan last year just before Christmas. Now it seems to be Christmas for people living outside Japan as well as Eagle Vision is going to release the DVD for the European and US markets. The European release date is August 21st and the US release will follow the very next day! Tony Iommi's radio show "Black Sunday"
Tony Iommi, Ronnie's bandmate from the Black Sabbath days, is going to launch 2nd season of his radio show "Black Sunday" on Planet Rock (http://www.planetrock.com/). The show will feature lots of unsigned bands - who should be sending demo CDs to them. More information through Planet Rock or Tony Iommi's own pages. Bob Daisley's (bassist from for example Rainbow and also shortly Dio) Hoochie Coochie Men will do a new studio album. It will feature a couple of Deep Purple guys, namely Jon Lord and possibly also Ian Gillan. In Kavarna, Bulgaria many rock musicians will have their statues erected on a local "Walk of Rock". Ian Gillan from Deep Purple and Ronnie are the first two to have their statues there! This time around just a quick update about the tour dates and a couple of other issues - the family life is sometimes like this, no much time to update pages)... The South American tour, which was planned originally for mid May, was postponed to July instead. The dates are now on the Master Of The Moon tour date page. Just a quick word about the Holy Diver Live DVD. It came out a couple of weeks back! It has the London show in the playing order (unlike the 2CD set, which had Holy Diver part separated on the 1st CD while the rest of the show was on the 2nd CD). There is also some interview footage with the band members as a bonus feature on the DVD. There is a six pack of Japanese CDs out there now! Or actually 3-pack of double CDs - which have three full shows from Rainbow's 1976 tour - the shows where On Stage was recorded. This CD box came out officially in Japan a few days ago. The first printing with a special Rainbow mouse pad was sold out almost immediately, but the 2nd printing without the mouse pad is still available. The Holy Diver Live 2CD was released yesterday by Spitfire Records! This is a live recording from London's Astoria Theatre last year on the "An Evening with Dio" tour where Dio played Holy Diver album from start to finish during their set. The first CD will feature the Holy Diver part of the show, while the second CD has the rest of the tracks from the set. I haven't received my copy of the 2CD yet but as soon as I get it, I'll post a review of it here for sure! Some more tour dates for late May and early June have been added, all in Germany. Check out the Master Of The Moon tour date page for the dates. Sorry for the shouting in the title, but RONNIE HAS NOT REJOINED BLACK SABBATH as I posted already in the previous news update. I've got tons of rumors and speculations from Dio and Black Sabbath fans by e-mail since the metal news sites brought this issue up around April 9th, and all I can do is to reply "No, those are just false rumors, Ronnie is still in Dio." Unlike I mentioned in my previous post, Ronnie's main reason for his visit to the UK was to promote the new 2CD "Holy Diver Live" release, live recording from the sold-out London Astoria show last year. In addition to that, he also spent some time together with Tony Iommi gathering some ideas for the forthcoming Black Sabbath box set. Some reports claimed that they were already recording something, but apparently he was just brainstorming with Tony. 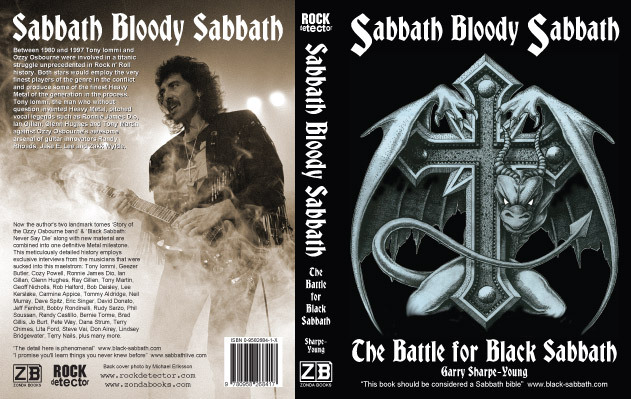 Garry Sharpe-Young has published a new book on Black Sabbath, titled "Sabbath Bloody Sabbath: The Battle for Black Sabbath" on Zonda Books. Garry is known of an excellent Black Sabbath book (Black Sabbath: Never Say Die) from a couple of years back - it is one of the rare examples of Black Sabbath related book which concentrates on the non-Ozzy Sabbath. The book cover can be found here. This book also focuses to the non-Ozzy Sabbath, from 1979 to 1997 like the previous book. However, this book also discusses Ozzy Osbourne during those years (Garry has also written a book about Ozzy, titled "Ozzy Osbourne: The Story of the Ozzy Osbourne Band"). The book is said to have loads of interviews from various Black Sabbath members - including for example Tony, Geezer, Cozy Powell, Ian Gillan, Tony Martin and, of course, Ronnie James Dio. The reviews and comments I've seen about this book this far have been all extremely positive. I will post a review of the book later on after I've got my copy of it. And after having read it, of course. It is already available for order - go to the publisher's web pages here for more information and instructions where to buy it. Fremantle Home Entertainment is going to release a double DVD heavy metal documentary. The DVDs will go through the heavy metal history from the beginning to today. The artist list who have contributed this is rather extensive - it includes Ronnie James Dio, as well as various members of Black Sabbath, Deep Purple Judas Priest, Whitesnake, Metallica, Twisted Sister and so forth. This DVD is going to be released in the UK on May 22nd, but it will have region code 0, making it playable on all the DVD players capable of showing the PAL standard DVDs. For more information, check out Fremantle's press release about this here. Craig is back in Dio! As reported earlier, he hurt his hand during the Russian tour last year and was replaced by Doug Aldrich for the remaining of the 2005 tours. There was some speculation and rumors who will be the guitarist in the future - whether Doug will continue and leave Whitesnake, or whether Craig will get better and be able to return to Dio. Doug stayed with Whitesnake and as Craig recovered, he is again the guitar man in the band. Now with Craig, the band is already working on the forthcoming, yet untitled album in the studio and are getting ready for the tour. The tour starts in May in South America and moves from there to Europe where they'll play some festival shows. Only a handful of the dates have surfaced this far, the latest addition is Miljoonarock Festival here in Finland on the 1st of July! Check the dates on the Master Of The Moon tour date page! According to the latest news reports, Ronnie has flown to the UK to write a couple of tracks with Tony Iommi for the forthcoming, tentatively titled as "Black Sabbath - The Ronnie James Dio Years" box set. The box set is said to have all the Black Sabbath albums with Ronnie in fully remastered form and these couple of tracks would be a special bonus to be included in the release. No schedule for the box set release has been published. There is also no word on the drummer, bassist or keyboardist for these songs. Dio ended the 2005 touring on the "X-Mas Is Heavy" tour in Scandinavia. Apparently the band had behaved well, since the last show of the tour - Oulu, Finland - brought a Santa Claus on stage. And not just one Santa Claus, but two! See photos from the event through the Master Of The Moon tour date page! ... The summer will bring Dio back in Europe to do festival shows again this year. It has been tradition for the last years to have Dio touring across the Europe in the festival season. The dates for the festival shows are not finalized yet, but they will start from Belgium on May 27th. Unfortunately no news about a North American tour at the moment. In December 2005 a very interesting piece of news leaked out - Ronnie will sing on forthcoming Queensryche album with Geoff Tate! The album is going to be "Operation Mindcrime II" and Ronnie will appear on it as Dr. X in the song The Chase! The album has already been recorded a while ago and the CD will hit the stores on April 3rd (or 4th in Europe), 2006! The record company behind this is Rhino Entertainment at least in the USA. Queensryche's home page has a couple of shots of Ronnie with Geoff Tate - check them out here! The full track listing can be also found on that page. Other musicians on the album include Michael Wilton and Mike Stone on guitars, Eddie Jackson on bass and Scott Rockenfield on drums. Queensryche is scheduled to appear on the Rockline show, and fans are encouraged to call as well. The live show will start at 8.30pm PT on Wednesday March 29th. Check out the radioshow's web site for more information. Tenacious D: The Pick of Destiny, Ronnie's movie debut, will apparently premier in March. However, there are some sources which list the premier as October 27th, 2006 or November 17th, 2006 so it still might take some time before we have the movie out. Ronnie and the guys are working on a new Dio album as I'm typing this in. They're going to spend some time writing the album and possibly also go in the studio before going on the road in May. The release date has not been set yet, but the aim is to have it out before the end of the year. Who will be the Dio guitarist in 2006? Craig was forced to leave the band after the Russian tour after hurting his hand. He played his last shows under heavy medication so that the band wouldn't need to cancel any gigs. Doug Aldrich, the guitarist from the Killing The Dragon album a few years ago, flew in to help the band to complete the tour in October and he also did the Scandinavian tour in December. There has not been any official statement about the guitarist for the next Dio album and tours. A while ago the fan club announced that the band is negotiating with Doug - but he's currently in Whitesnake, and was just helping Dio to complete the touring in 2005. According to David Coverdale, he and Doug have written a couple of songs for a future Whitesnake album project. Meanwhile, there haven't really been any official news about Craig. Currently some news services claim that Craig would be in the studio working on the new material and would be joining the band on the road. However, still no official word on the matter. Time will tell - the band will hit the road in South America we'll see who is playing the six string there. There have been lots of Dio related articles in various music magazines recently, especially in Europe where Dio has been touring extensively. In the UK, Ronnie has been twice on the Classic Rock magazine; first going through the remastered Holy Diver album track by track and then in the December issue there was a full page review of the gig in London. The Terrorizer magazine interviewed Ronnie - the interview caused some stirr on the Dio mailing lists and discussion forums on the Internet after a couple of comments about George W. Bush and Ozzy Osbourne. In Sweden the "Rundg�ng" show on SVT2 will have a Dio special - apparently the full show dedicated to Dio - in May-June timeframe. It was already planned for earlier screening but was then pushed to the second leg of the show. The "Holy Diver 2005" tour was filmed in London for a future DVD release. The band originally was going to film a show in Russia earlier on the tour, but then decided to film it at Astoria in London. They had also a camera following them at a couple of other shows, mostly at backstage, to film some extra material for the DVD. The release date for the double CD release will be April 17th, 2006 for us on the old continent, a day later for the American fans. The DVD should follow on May 30th in the USA - and most likely May 29th here in Europe. The offering will be called Holy Diver Live and, as can be seen above, the first CD will have the pure Holy Diver set while the second CD will contain the other tracks played at the Astoria. The record company for this will be Eagle Rock Entertainment/Spitfire Records. A frequent Dio.net visitor visited the band at the studio when they were putting the DVD together and according to him, this will be quite a treat! VH1 is currently working on a 4-hour document about heavy metal, how it all started in the late 1960s and evolved to what it is today. It will feature a lot of bands, including Dio. The filming has already started - Ronnie, as well as Rob Halford and Sebastian Bach appeared recently as panelists at the TV Critics Association's annual winter convention in Pasadena, CA and it was filmed for this document. The document will be shown in a series of four themed hours on May 1-4, 2006 at 9pm on VH1. It has finally happened! The Rock Palast show has been finally released on DVD! Not as a bootleg DVD but officially! This is from the Olympiahalle in Munich, Germany filmed on October 20th, 1977! The DVD was released in Japan on December 21st as a 2-disc release by VAP, Inc (VPBR-12464, region code R2). The first disc contains the gig while the second disc contains interviews with Colin Hart (tour manager) and Bob Daisley as well as the three promo videos from the Long Live Rock 'N' Roll album - L.A. Connection, Gates of Babylon and Long Live Rock 'N' Roll. There is also a booklet included with the release. The promo videos are a treat - they're previously unseen versions! The footage is from a studio - same as on the previously seen promo videos - but all the "on location" shots with camels in Babylon and Volkswagen Beetles in Los Angeles are missing. The songs are different than the album versions of them in what comes to the lyrics. This DVD was going to be released in early 2006 Europe as well, but it was then postponed to June 2006. Reason for the postponing is not known, but it has been generally believed that VAP has acquired the world-wide distribution rights for the Japanese release for certain amount of time. The first reports say that it is going to be a single, dual layer disc release in Europe, but that remains to be seen. This far no news about US release. Three Rainbow live CD sets coming! Remember the "Live In Germany 1976" (which was also rereleased as "Live In Europe" at some point)? It was compiled from a number of gigs in Germany. Remember the "On Stage" CD? Same deal. Now three full gigs of those German shows will be released as double CD sets, according to The Rainbow Fanclan Legacy site! The first one is going to be called "Live In Cologne 1976" and should be out in Japan on September 25th, 1976. The other two in the pipeline are from Dusseldorf and Nurnberg. Although the original release is meant for the Japanese market, these should be released by AFN in Europe as well. US release is not in the horizon as far as I know. Ian Gillan's "Gillan's Inn" album is coming out on April 17th, 2006. It will have tracks covering Ian's 40-year career with many Deep Purple and Black Sabbath family musicians - including for example Jeff Healey, Roger Glover, Ian Paice, Steve Morse, Tony Iommi, Mickey Lee Soule, Jon Lord and naturally also Ronnie James Dio. Ronnie will sing backing vocals at least in one song - and Mickey Lee Soule, ex Elf and Rainbow pianist, will also play in the song. The album will be released in the new DualDisc format. The CD side will have the complete album in stereo, while the DVD side will have the complete album in 5.1 surround sound in stereo. In addition to that, there is a bunch of video footage and extras included. For full track listing, please visit Ian Gillan's site here. Jeff Pilson, bassist on some Dio albums, is on the road with Foreigner. He also appears on their forthcoming live album. The Butterfly Ball concert from the Royal Albert Hall, London all the way back in 1975 has seen the light on a DVD. Ronnie did a couple of songs on The Butterfly Ball album, but did not appear at the concert because of Rainbow schedule problems. Mickey Lee Soule - keyboardist from Elf and Rainbow - along with a large number of other musicians appear on the DVD though. Warner Home Video is going to release "Metal: A Headbanger's Journey" double DVD set in the USA on May 23rd, 2006. The DVD set will contain loads of interviews, including Ronnie James Dio and Tony Iommi. It should go through the heavy metal history from the very beginning to what it is today. A trailer is available here. ESP - Eric Singer Project - will do a short Australian tour in April - 19th in Melbourne, 21st-22nd in Sydney. Chuck Garric will play bass on the tour - Chuck has played with Dio on a couple of tours as well and also appears on the newest Dio album too. Dio's ex bassist Jeff Pilson and ex drummer Vinny Appice played on the recent "Ashes to Glory" CD by Minory Niihara, Loudness frontman. The CD was released only in Japan by Tokuma Japan Communications.